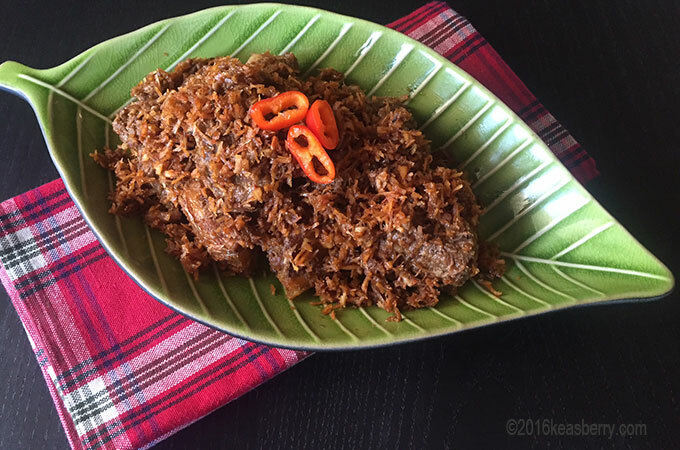 Dendeng Ragi – Sliced beef with grated coconut. Dendeng originally comes from West Sumatra and means thinly dried meat, which is preserved through a mixture of spicy marinate and dried through the frying process – originally in the sun. Dendeng Ragi, it’s distant cousin from middle Java region is soft and somewhat sweet in taste. This can be served with steamed rice and Sayur Lodeh (vegetable stew). Pound or grind the spices into a paste. Mix the coconut, the beef, the spice-paste, langkuas, salam leaves and lemon grass in a saucepan. Add about 250 cc water and simmer mixture on low heat, stirring occasionally. When the water has boiled away, put contents in a skillet or wok. Add the oil and fry the mixture until the meat and coconut are golden brown and dry. Drain and take the excess oil from the mixture. Add the peanuts and stir until well- blended. Note: one medium coconut will yield 3-4 cups fresh grated.